Puppy socialization is the only period of a dog’s life when you can actually change and create most of the dog’s behaviors that will stay with him throughout his life. Essentially, you can completely shape your dog’s view of the surrounding world and how he will react to it and behave in it. How many of you know that during the puppy socialization period you can even manage (or completely change) a dog’s instincts and drives? The answer is very simple: You don’t have a choice! With your input and guidance. Do you have a dog that will behave properly and be a valuable part of the family and society? Or your dog will create behavior patterns on his own and you will have to deal with them at some point later in life. Dealing with already established behavior patterns will require time, investment, and there are no guarantees that it will be successful. Approximately 16 weeks; by the 16th week around 85% of a dog’s brain is developed and the puppy socialization window is almost closed. What your dog hasn’t learned or gotten familiar with by this point will become a problem down the road. At that point in time, it will become a long, time-consuming process to fix/adjust it and as mentioned, in some cases it would be impossible to fully overcome. How easy is it to make mistakes when socializing your puppy? In today’s world there is a lot of information on how to do proper puppy socialization, but unfortunately most of that information is based on outdated concepts that either tell you to keep your puppy away from everything until he is about 6 months or older (which will probably create fear-related behaviors), or to invest your time into overcrowded puppy kindergartens or supervised dog parks where your dog will just become classically conditioned to get overexcited every time he sees another dog. The same goes with your dog’s reactions to other people, inadequate exposure may create an aggressive dog; however inappropriate exposure will create a dog that will get hyper-excited every time he spots someone on the street. In order to avoid mistakes and not to waste your valuable time, check the links below to find details and guidance in how to get the best out of your puppy’s socialization period. This is a step-by-step guide to the first levels and steps of puppy socialization. Most people don’t know that the first steps are done shortly after the puppy is born (in the neonatal phase) and go on from there. Here you can find out what the duties of responsible breeders are, and how many issues can be created before the first 6 weeks of your dog’s life. What are your first steps as the dog’s owner? 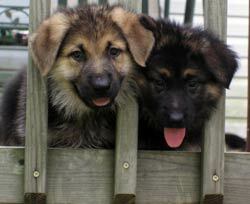 For more details about puppy development click here! This is one of the biggest steps in your dog’s life. How your dog will deal with distractions and the world around, in general. Dogs are animals completely different than humans and they have different relationships and views of the world than we do. If you skip this important step with your dog, and don’t create behavior patterns that you like, your dog will create his own behaviors during the puppy socialization stage. If your dog ends up with dysfunctional behavior patterns towards the environment, you will have only partial and limited success in fixing these down the road. In order to start out on the right foot, click here! Playing with your puppy is the first step in building a solid relationship during the puppy socialization period and it goes throughout your dog’s life. For more details click here! For more details about this please click here! This part of the website was created for you, so that you can give the best start to your dog, remember that we can do training or other dog related exercises and activities down the road, but once the socialization period is done, we can’t turn back time and reopen the box again. 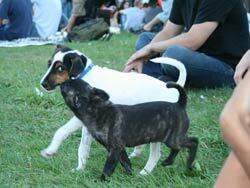 What about the dogs that have missed out on proper socialization during the puppy socialization period? Dealing with dogs that have missed out on proper socialization during the puppy socialization period and now are displaying what we call “dysfunctional behavior patterns” goes under the behavior modification umbrella. Some dog trainers also try remedial socialization. Remedial socialization is basically just a different term for exercises in which you use desensitizing and counter conditioning principles. How much can remedial socialization help?